The DNSODM200_RLDRAM-II_SIO is a SODIMM module that can be installed in a 200-pin DDR2 SODIMM socket. This module contains two RLDRAM II chips in a 32M x 36-bit configuration for a total of 144 megabytes. Stuffed with the two Micron MT49H32M18Cs, all the features of RLDRAM II-style DRAM can be realized including non-multiplex addressing, double data rate clocking, and dramatically reduced data latencies. This SODIMM has separate data paths for input and output. The target frequency of operation with DN9000 and DN7000 series of products is 250MHz, with stuffing options (both FPGAs and RLDRAMs) to higher frequencies. 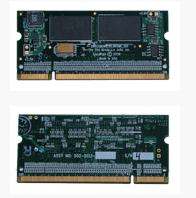 The DNSODM200_RLDRAM-II_SIO is compatible with 200-pin SODIMM DDR2 sockets on all SODIMM socket equipped Dini products.